Malt Shop Memories Classic Slot Guide & Review - Casino Answers! 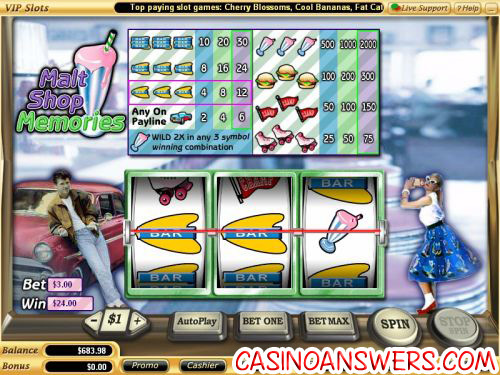 Malt Shop Memories is a 3-reel, 1-line classic slot machine with a wild symbol and multiplier, developed by Vegas Technology. You can play the Malt Shop Memories classic slot game at US-friendly online casinos Super Slots Casino and English Harbour Casino. To play Malt Shop Memories, you can keep it at the default coin size of $0.25 or set it to $0.10, $0.50, $1, $5 or $10. You can then use “Bet One” to set the number of coins (up to 3) or “Bet Max” to play the maximum bet of 3-coins. Use the “Spin” button to play. If you wish to skill stop a spin early, you can use the “Stop Spin” button during a spin. The Milkshake symbol is Malt Shop Memories’ top fixed jackpot. 3 Milkshake symbols on the center payline will win you 2000 coins! The Milkshake symbol is also Malt Shop Memories’ wild symbol and multiplier. Not only will it a complete a winning combination, but it will also double it! Payouts on the Malt Shop Memories classic slot machine are as follows (1/2/3 coin payouts in parenthesis): 1 Car symbol (2/4/6), 3 Single Bar symbols (4/8/12), 3 Double Bar symbols (8/16/24), 3 Triple Bar symbols (10/20/30), 3 Rollerskate symbols (25/50/75), 3 Pennant symbols (50/100/150) 3 Burger symbols (100/200/300) and 3 Milkshake symbols (500/1000/2000). Open up Malt Shop Memories’ autoplay mode by using the “AutoPlay” button. You can set the number of spins (from 5 to 500), the number of seconds between spins (1, 1.5 or 2) and stop settings including to stop once all spins are complete, stop when jackpot is won, stop if a win exceeds or equals (from $50 to $250), stop on any win and to stop if credits are increased/decreased (from $50 to $250). You can cancel the autoplay mode at any time by hitting the “Cancel AutoPlay” button. Get a 100% up to $2,000 signup bonus on your first four deposits to play Malt Shop Memories when you sign up at Super Slots Casino! Are US players able to play Malt Shop Memories for real money? They sure can! US players can sign up and deposit at all Vegas Tech online casinos, including a few of our favourites Super Slots Casino and English Harbour Casino. Are there any other 50’s themed slot machines around? We haven’t found too many, but there is one you can find at Rival-powered online casinos like Pantasia Casino called Atomic Age. We’ll keep our eyes out for more and update this page when we see something. Malt Shop Memmories? Malt Shop Memories? Malt Shop Mammories?